We’re just a week away from our Kinder’s summer break and we couldn’t be more excited to enjoy the summer now that we finally have a big backyard. We officially moved to a new home 2 weeks ago and though the unpacking might take some time (maybe a year, yikes), the fun immediately started. Starting off with a dip in the pool, running around the backyard, and the kids riding their bikes and their new Hello Kitty RV 4×4 Ride-On by Dynacraft. We used to live in a multi level condo and play was limited. Now the kids can explore in the backyard and ride their car as much as they want especially this summer. Thanks to Dynacraft for introducing us to their brand. The Hello Kitty 4×4 Car arrived in a big package unassembled, fits half the back of our minivan. I’m the worst at reading manuals so I asked the hubby to put it together and I was gonna help him. I put the kids to nap so they won’t know what we’re up to.. we wanted to surprised them but I ended up dozing off, LOL. By the time I got up, the hubby is about 90% complete with the assembly. I asked if it was hard to put together feeling guilty that I left with the whole thing, haha, he said not really. I got really excited that it was ready but the hubby told me it would take 18 hours to charge it initially. So warning to parents getting their kids excited about riding their ride-ons after assembly. 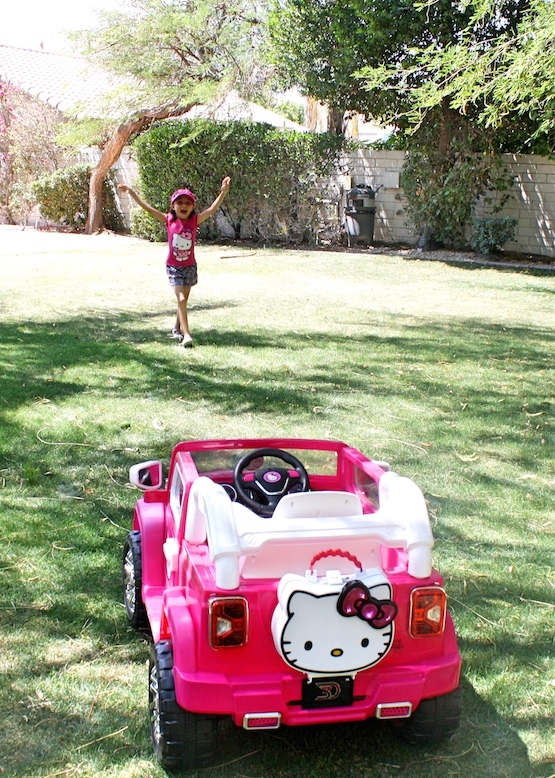 Don’t forget that this Hello Kitty car don’t run on triple A batteries, haha. Good thing the plan was really to surprised them so we just lock it in the office to charge overnight. Both the hubby and I were very impressed with the design of the Dynacraft Ride-on Car. Really, a thing of beauty. We were both saying “wow, it looks really good” as we try to finish putting the car together. Well made, it’s not just some car that you plaster with stickers to look like a car. It has all the bells and whistles including a removable light up Hello Kitty bag in the back and you can also hook up an iPhone to play music. I wish I can fit in it or be a kid again. 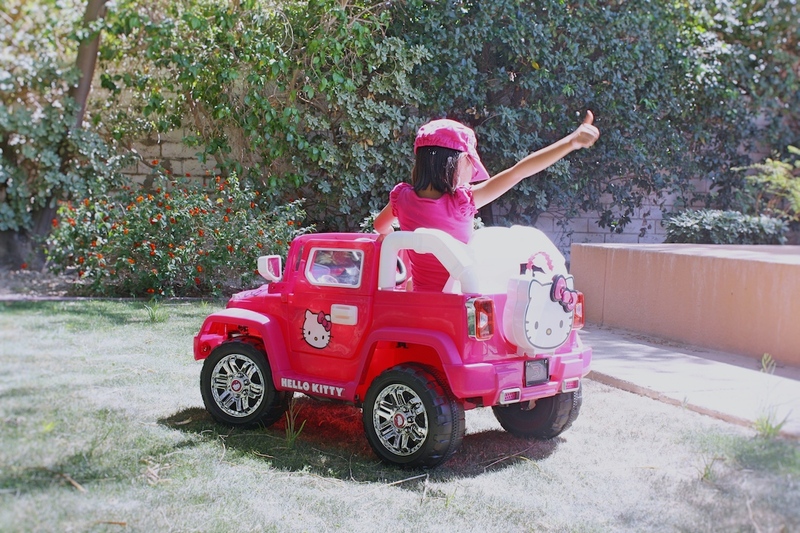 The Hello Kitty Car is for ages 3 and up. It has “Chrome” grills, off-road fog lights detail and oversized traction tires, 2 functional doors that open/close and lock, forward and backward driving functionality with a max speed of 2.5 MPH. It has a working horn and an MP3 input with speakers plus a removable light-up bag on the back. We put the toddler to nap the following day so we can first surprised big sis’ with the car so they won’t fight over it. If you have two kids, you can actually order ride-ons that sits two. Check out the other cars offered by Dynacraft HERE. Big sis’ was very happy when we presented her with the car. She knew about the car but didn’t know when we’d bring it out. She’s been waiting for some time. She was so happy she was screaming without a sound. LOL. She drove around and around and looked at every part of the car before lil’ sis’ woke up. Lil sis’ reaction on the other hand was priceless. She is into all things Hello Kitty and the surprised really woke her groggy self after she just got up from her nap. Check out their reaction on the video below. If you are looking for a ride-on car for your kids, I highly recommend checking Dynacraft Wheels. They are nicely designed and are well made. 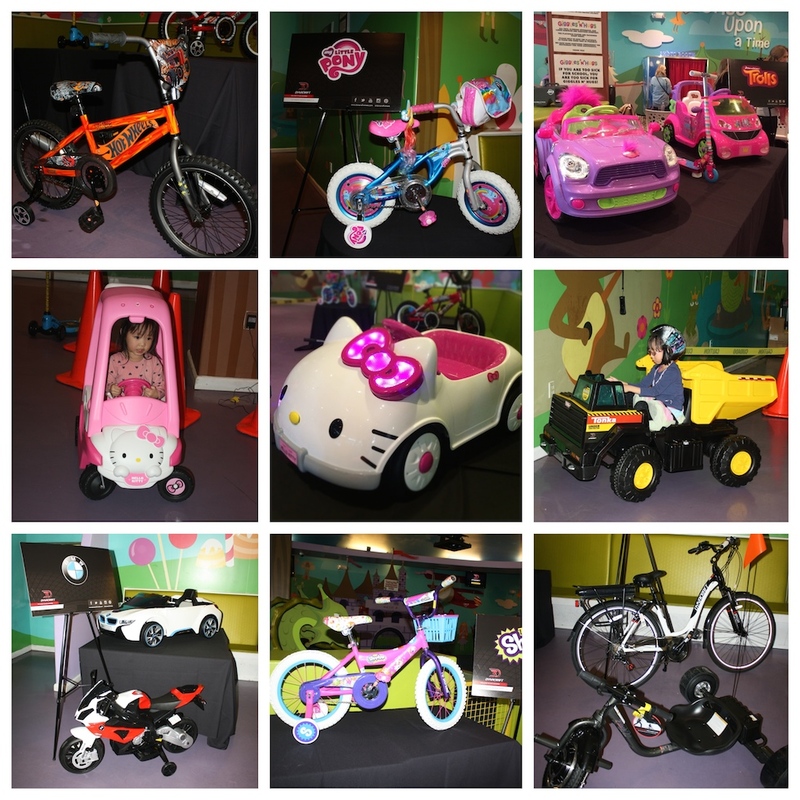 And all the new designs they have come up will make any kid and even parents very excited, it surely made me excited. They also carry bikes, tricycles, and scooters. 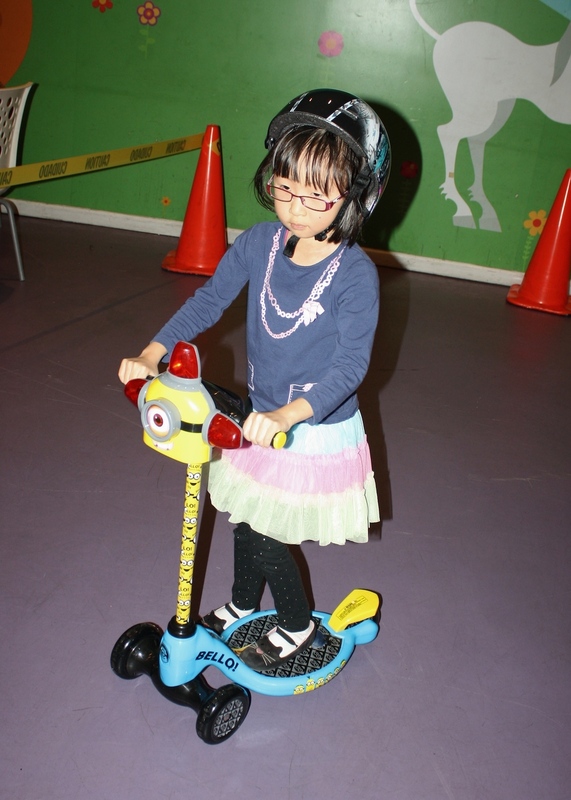 I’m eyeing on getting big sis’ the Minion Scooter for her birthday because she really fell for that when she got to try it months back. It has a big foot base and makes this cute “be-do” sound. Check out the other designs that Dynacraft already carries as well as new designs that will come out this summer. We saw and tested some of them during a media preview and they all looked amazing. Which one is your favorite? Happy Summer Everyone! Let us know what you guys will be up to this summer! Follow @anytots on Instagram, Twitter and Facebook.